Android P has an in-built function keeping track of recent notification sent to you so that you can disallow the app if you don't want to keep receiving notifications again. Android has long been keeping track of notifications in the hidden log menu. There are some apps that pull data from this menu (like Unnotification), but it's not exposed to users in the settings. 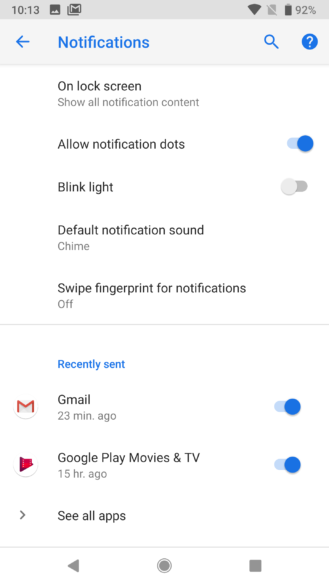 Android P adds a section to the settings where you can see the last several apps that sent notifications. This menu is available in Settings >> Apps & Notifications >> Advanced >> Notifications and scroll down to the bottom to see "Recently sent." This feature is effective to an extent that it keeps the time record of when you were being pinged and has a quick toggle to disable it immediately. It is very impressive feature to have even seen on smartphone, so no more someone pestering your phone with notifications.